Although I can’t envision life without daily infusions of stride piano, I’ve never managed to warm up much to boogie-woogie. 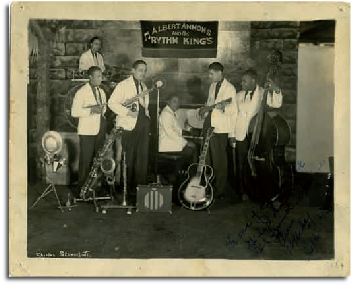 At its peak, that late-Thirties style featured three rotund, cheerful players — Albert Ammons, Meade Lux Lewis, and Pete Johnson — whose collective sonic effect was a roaring express train aimed at the listener. But each one of the trio was a splendid soloist who could venture beyond eight-to-the-bar conventions, given the chance. Their slow and medium-tempo blues, especially, moaned and rocked. And they were superb leaders and accompanists: Big Joe Turner and Johnson made a wonderful team. 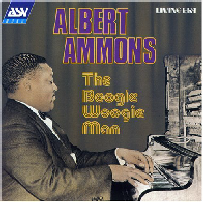 But Albert Ammons is not often given his due. Slightly later, there was a romping session with Harry James (a Texan who knew how to play the blues), the Port of Harlem Jazzmen for Blue Note, and a 1944 Commodore session that produced four titles. One of them is an instrumental slow blues, “Bottom Blues.” Whether the title refers to the tempo, the overall funkiness, or the reference is anatomical, the music is imperishable. 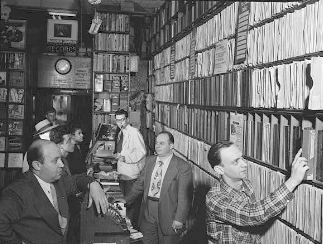 On February 12, Milt Gabler, the patron saint of Commodore (pictured here in his record shop — thanks to the late William Gottlieb for capturing this shrine for posterity), put together one of those compact bands that blossomed in 1944 on Keynote, Savoy, Blue Note, Wax, Jamboree, and other small jazz labels. Most jazz historians ritually excoriate James C. Petrillo, then president of the musicians’ union, for provoking the record ban of that period, but the irony is that the ban provoked some enterprising jazz-lovers into capturing transcendent music that the major labels wouldn’t have been interested in. For once, commerce and art — however unintentionally — worked together. Jazz listeners are always frustrated record producers, who think, “That band would have been just perfect if I had been able to replace Kid Pippin with Sox McGonigle,” on into the night, but this sextet admits no such after-the-fact meddling. In the jazz family tree of recording dates, we can find connections among the three horn players, but this is the only record date I know of with this front line: Hot Lips Page on trumpet, Vic Dickenson on trombone, and Don Byas on tenor sax. As a teenager, bassist Israel Crosby had worked and recorded with Ammons in Chicago, and Big Sid Catlett — everyone’s first choice — was in town. The four selections recorded that day are all blues — medium slow, medium, fast, and slow. Page and Dickenson were known as splendid bluesmen, squeezing Dionysiac ecstasies into the narrow confines of twelve bars. Byas’s style may have seemed more urbane, but he had deep Basie – Kansas City roots as well, and he plays nobly. The slow tempo, in addition, keeps him from falling back on the up-hill-and-down-dale rhythmic patterns he liked when he picked up speed, echoing Coleman Hawkins. “Bottom Blues” is structurally very simple — a series of solo improvisations on the twelve-bar blues form, leading up to ensemble riffing at the end. Ammons begins with a musing, suspended-animation four-bar introduction, almost tentatively setting the key, the tempo, and the mood, before moving into a simply played blues — with only Catlett, on brushes, behind and alongside him. It’s as if he’s thinking about what he might be playing while he is doing it. Catlett, as I’ve written in this blog, could play with great force and volume. Although he adds notable intensity as the performance builds, he sticks to the wire brushes rather than using sticks. In his solo chorus, Ammons offers brief glimpses of familiar piano blues motifs, but with surprising delicacy. He does suggest eight-to-the-bar rolling rhythms at several points, but they are implied rather than stated: his bass patterns hint at Teddy Wilson, Earl Hines, even Fats Waller. The effect is thoughtful rather than assertive, and someone hearing this recording for the first time might not identify him as a famed boogie-woogie stylist. Vic Dickenson takes the next two choruses, and Ammons’s accompaniment has a simple, forceful architectural logic, as he restricts himself to simple block chords in the first chorus and becomes more ornate in the second. Dickenson’s playing has always been praised for its “vocal” quality, its smears, growls, and moans. Justly so, but was there ever was a singer as eloquent as Vic is here? Could any voice create such sounds, bearish growls and sinewy moans, moving from side-of-the-mouth satirical asides and grief? At points it sounds as if his sound is huge, barely contained, exploding into our ears. Vic’s second chorus, propelled by Catlett accents, takes a simple phrase and turns it around and around, holding it up to the light before moving more rapidly into double-time and a few exultant shouts, like a man with so many things to say who knows his time is running out. We should also hear, behind the growls and snorts that seem to characterize Vic’s solo and his style, a deep allegiance to the vein of exuberant melancholy we hear in Twenties and Thirties Louis — play this solo next to “Gully Low Blues” and hear the emotional kinship. By contrast, Byas sounds supple and suave, gliding from one phrase to another, extending the harmonies as if to remind us that this is, in fact, 1944, and that Dizzy and Bird are in town. He is aided immensely by the two horns humming behind him, felt more than heard — voices in the choir adding harmonic support. Saving Lips Page for last was not just a good idea; it was inevitable, for no one wanted to follow him on a blues performance. His solo isn’t appreciably high, loud, or fast, but it is the very quintessence of intensity. Like Vic, he manages to get so many different sounds out of an unforgiving piece of brass tubing — slides, glissandos, half-valve effects — that would be impossible to notate. And I defy any trumpet player today to reproduce these twenty-four bars convincingly. But what we hear is light-years away from trumpet plus rhythm, as the four players drift into electrifying multi-layered polyphony, with Crosby getting even more earnest, Ammons varying his accompaniment, and Catlett urging, commenting, and agreeing to what he’s just heard. When Ammons returns, it’s not merely an interlude to give the horns time to get into position: he is more rhythmically assertive, with wonderful dialogues going on between his spattering Hines right-hand figures and the ocean-motion of his bass line. The orchestral polyphony broadens, as the three horns take the simplest moaning figure, as old as King Oliver’s solo on “Dipper Mouth Blues” — rocking back and forth between two notes with plenty of vibrato — and balance it against Ammons’s interjections, Catlett’s accents (he has become an entire section in himself!) building and building, with his cymbal crash the last word. What a moving interlude! Jazz, like other arts, always implicitly asks the question of how can we make the familiar new and vividly alive? In this case, how do these six musicians, individually and collectively, take the same phrases that every jazz improviser in 1944 knew by heart and make them seem fresh? The answer may lie in a strong sense of self, of defiantly individual voices, of superb technical mastery, of intense passion. The question of HOW may defy words, but “Bottom Blues” shows itself as lasting, emotionally powerful art. Happily, I can report that someone besides myself cares deeply about Albert Ammons — in this case, his granddaughter Lila has set up a site to celebrate his memory: www.albert-ammons.com. And although the ASV CD which contains some of his finest work may be out of print, “Bottom Blues” should be available. It is down-to-earth and celestial at the same time, worth repeated listenings. This entry was posted in Jazz Titans, The Things We Love and tagged Albert Ammons, bebop, Big Joe Turner, Big Sid Catlett, blues, boogie-woogie, bottom, Charlie Parker, Coleman Hawkins, Commodore Records, Count Basie, Dizzy Gillespie, Don Byas, Earl Hines, Fats Waller, Guy Kelly, Harry James, Hot Lips Page, Israel Crosby, James C. Petrillo, jazz piano, Jimmie Noone, Kansas City, King Oliver, Lila Ammons, Meade Lux Lewis, Milt Gabler, Pete Johnson, recording ban, Teddy Wilson, Vic Dickenson. Bookmark the permalink. Occasionally, one might hear some food editor waxing eloquently about a certain dish and the reader is so struck that he wonders, “I’ve got to have a taste of that.” If you can read this piece about Albert Ammons and not want a taste, you aren’t reading English. Ammons was a marvelous pianist with a powerful right hand that had a jab like Mohammed Ali. Jazz and Boogie Woogie all have examples of “truth” and Bottom Blues is one of them. Deliciously written, Michael. The ASV CD shown is still very much available on CDNow (Amazon) for $11.98 new or $7.80 used. Among its 23 tunes are 4 that run over 4 minutes, including “Bottom Blues”. And you talked me into it: I ordered a copy. This is a beautiful elegy to a legendary, moving moment in jazz history. Another, equally deeply felt and musical retelling of the events on that day can be found in a piece called “Paragraphs,” written by Hayden Carruth, a poet whose work was heavily influenced by jazz and the blues. Gabler himself read the account, covered in the final 3 sections of the poem (#26-28), which was included in the book, “Brothers I Loved You All,” and called it “Not a bad parlay.” I encourage anyone who loves the tune to pick up a copy of the poem (also included in “Collected Shorter Poems,” from Copper Canyon Press), hit “play,” and read along.